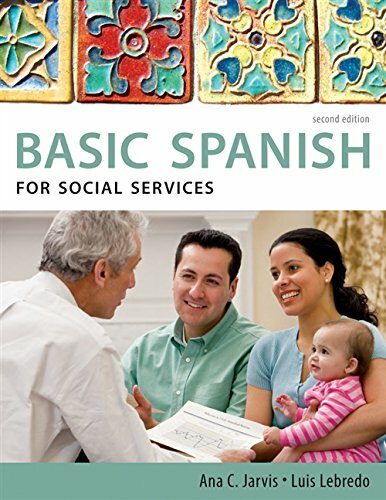 BASIC SPANISH FOR SOCIAL SERVICES is a career manual designed to serve those in the social services professions who seek basic conversational skills in Spanish. Written for use in two-semester or three-quarter courses, it presents everyday situations that pre-professionals and professionals may encounter when dealing with Spanish-speaking clients, patients, and personnel in the United States at work settings such as hospitals and Department of Social Services offices. BASIC SPANISH FOR SOCIAL SERVICES introduces practical vocabulary, everyday on-the-job situations, and culture notes (Notas culturales) written from a cross-cultural perspective. It provides students with opportunities to apply, in a wide variety of practical contexts, the grammatical structures presented in the corresponding lessons of the Basic Spanish core book. Ana C. Jarvis, a native of Paraguay, was born in Asuncion and attended school in Buenos Aires, Argentina. She received her Ph.D. in Spanish from the University of California, Riverside, in 1973. Dr. Jarvis retired from Chandler-Gilbert Community College after a long and distinguished career. Prior to CGCC, she taught at Mesa Community College; the University of California, Riverside; San Bernardino Valley College; Brigham Young University; and Riverside City College. In addition to authoring numerous Spanish textbooks, she has published several short stories in Spanish. In 1988, she was chosen as "Faculty Member of the Year" at Chandler-Gilbert Community College. Preface: Leccion preliminar: Conversaciones breves.Communication: Greetings, farewells, and simple conversations to gather information. Leccion 1: En el Departamento de Bienestar Social (I). Communication: At the Department of Social Welfare: assisting with filling out a form. Leccion 2: En el Departamento de Bienestar Social (II.) Communication: At the Department of Social Welfare: screening people who apply for financial aid. Leccion 3: En el Departamento de Bienestar Social (III). Communication: At the Department of Social Welfare: asking questions about family; helping people apply for welfare. Leccion 4: En la Oficina del Seguro Social (I). Communication: At the Social Security office: processing a new Social Security number; serving applicants for a work permit. Leccion 5: Una entrevista. Communication: At the Department of Social Welfare: interviewing people applying for welfare. Lectura 1: SUBSIDIOS ADICIONALES DE ASISTENCIA PUBLICA. Repaso (Lecciones 1-5.) Leccion 6: Al ano siguiente. Communication: At the Department of Social Welfare: reevaluating welfare recipients. Leccion 7: Estampillas para alimentos. Communication: Explaining the food-stamp program. Leccion 8: En el departamento de Servicios Sociales. Communication: Helping someone apply for the food-stamp program. Leccion 9: El programa de empleo y entrenamiento (I). Communication: Explaining a work-and-training program to an unemployed person. Leccion 10: El programa de empleo y entrenamiento (II). Communication: Assisting an unemployed mother improve her chances of finding work. Lectura 2: DEPARTMENTO DE SERVICIOS SOCIALES DEL ESTADO DE NUEVA YORK. Repaso (Lecciones 6-10). Leccion 11: Medicaid: El programa federal de servicos medicos. Communication: Talking to Medicaid applicants: explaining the program. Leccion 12: Maltrato de un nino (I). Communication: Investigating child abuse. Leccion 13: Maltrato de un nino (II). Communication: Child abuse: talking to abusive parents. Leccion 14: Ayuda a los ancianos. Communication: The elderly: making a house call. Leccion 15: En las Oficina del Seguro Social (II). Communication: Long-term disability: talking to an injured person about rights and obligations; talking about long term disability benefits Lectura 3: !NO SE DESQUITE CON SUS HIJOS! Repaso (Lecciones 11-15). Leccion 16: En la oficinia de Medicare (I). Communication: Explaining Medicare. Leccion 17: En la oficinia de Medicare (II). Communication: Answering questions about Medicare. Leccion 18: Resolviendo problemas. Communication: Talking about AIDS; talking to the spouse of an alcoholic. Leccion 19: Consejos a las madres. COmmunication: Talking to a new mother; advising parents about child development. Leccion 20: El ingreso suplementario. Communication: Answering questions bout supplemental income. Lectura 4: Aviso. Repaso (Lecciones 16-20). Appendix A: Introductiong Spanish Sounds and the Alphabet. Appendix B: Verbs. Appendix C: Useful classroom expressions. Appendix D: Weights and measures. Spanish-English vocabulary. English-Spanish vocabulary.